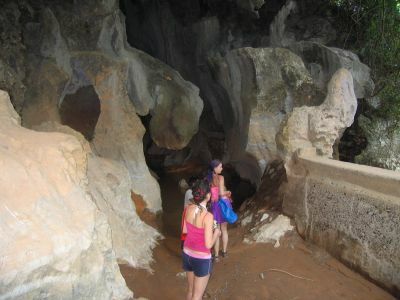 there are many caves to explore along the nam xong river in vang vieng. 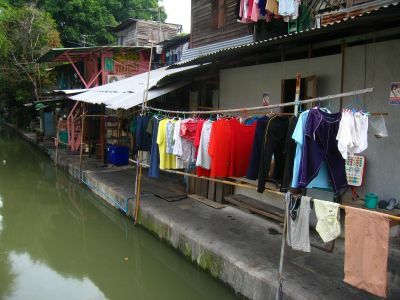 just like ordering a beer, someone with a bamboo pole will pull you in from the river to the bank to the cave entrance. you get a guide and a flashlight for about $1. here marie, camilla and i join new friends sepi and jared from australia on an impromptu cave tour. camilla wades through an underground stream inside the cave, followed by sepi and jared. camilla makes it through a tight spot in the cave...with a smile on her face. back on the tube, here's a mike-eye view of the nam xong river and the mountains above it. at the end of the trip the river shallowed and the laos children flocked to our rescue. we were all connected at this point, by arms and legs, and they pulled us along to our final destination. when you asked their names they all answered "johnny" - thus from then on whenever you'd see them around you'd say: "hey, look at all the johnnies", or "look at all the johnnies i've got on my tube." sometimes you'd see a nice looking girl float by with 4 or 5 johnnies sitting on the edge of her tube. and here is the restuarant we ended up at at day's end. 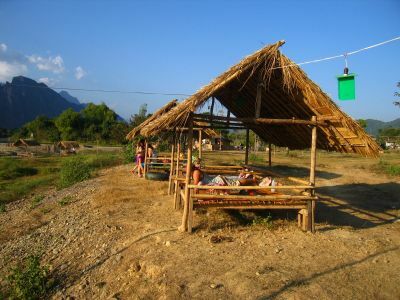 chilling in a bamboo hut on the riverside with views of the peaks, the warm breeze on you, good friends around, and a beerlao in your hand. what a life. from the tranquility of laos to the chaos of bangkok, thailand. 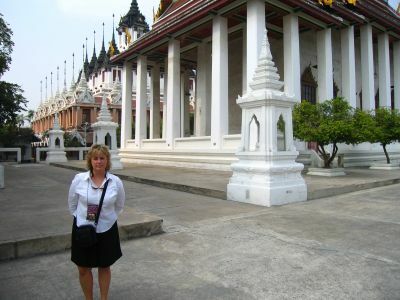 my sister debra came out to see me from december 22nd-29th and we explored bangkok and the area around it. 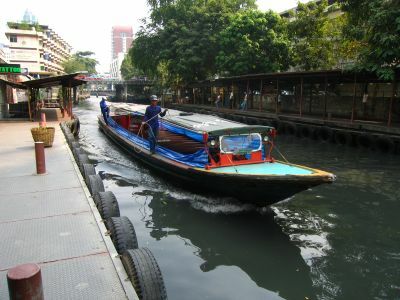 we took a high speed canal boat into town each morning from our hotel. the blue plastic sheets on the sides were raised whenever the boat got going to prevent the horrible gray disgusting water from splashing on your face. fun ride though. the boat hardly stopped at the pier at all - you basically had to fling yourself aboard when it paused at the platform and hope you didn't fall off. we were the only tourists who rode the thing.